The small footprint of Quantum Rehabilitation Stride elliptical is just 44 inches, compact enough to fit in the corner of any room. It has a low step-up height and secure handrails for a safe, comfortable, and convenient daily workout. The Quantum Rehabilitation Stride elliptical console has a large 21" x 8" dot matrix LED display to show resistance, heart rate, percentage of max HR, target zone, time, distance, stride, calories, and watts. The pre-defined programs include manual, random, hill, interval, 5K, weight loss, and Fitness Test. Heart rate control programs include cardio, interval, and fat burn. Weight / Dimensions: 315 lbs / 32" x 43.5" x 65"
The Quantum Rehabilitation Stride elliptical features a 110-volt Eddy current brake system with 20 levels of resistance, commercial gauge steel frame, sealed roller bearings on all pivots, cushioned foot pads to lessen foot fatigue, ergonomic hand grips to reduce stress on the wrists, removable upper body workout arms, a low 7" step-up height, 400-pound max user weight, and a fixed stride length of 21 inches. The unique center-drive technology allows for smooth and seamless motion that is easy on the knees, hips, and ankle joints while maintaining core stability and balance. The foot pedals that are less than 2 inches apart which keeps your body aligned and provides for a natural stride motion for optimum comfort and minimal knee flex. Along with a full range of workout data, the console also has Personal Profile Storage that records personal data, workout time, total distance traveled, total calories burned, total number of workouts, and the last three fitness scores. A wireless heart rate strap is included as standard equipment. 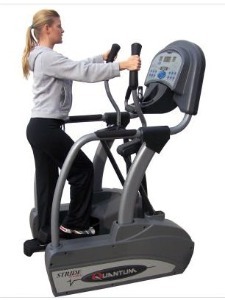 Reviews on the $2,349 heavy duty Quantum Rehabilitation Stride elliptical (MSRP: $3,499) are excellent as expected. It is a self-generating elliptical; meaning you don’t need a plug-in, just start pedaling and the console lights up. It is surprisingly easy to set-up, has a very compact footprint with a heavy sturdy base, and offers a tough workout to elite athletes as well as low resistance settings so that it can be used by people in rehab and senior citizens. You’ll feel very safe on this Quantum machine and look forward to daily workouts. It rates a Best Buy.